At this time of high stakes and heightened bars within the vastly expanded and more competitive landscape of episodic television, the challenges for showrunners and writers to carve out an inviting realm where viewers are inclined to return must be daunting. Such a climate induces grand visions of creating the next prestige show that has people gushing over bar banter and exchanging clever insights through the twittersphere during the course of a given episode. Even comedies are conceived under the pressure of delivering the next Girls or Atlanta, where humor is found within the layering of complex social commentary, giving it bite. All of this contextualizing of home viewing entertainment produces content that will stimulate and enthrall but also has a way of alienating the person looking for easy going, character driven amusement that doesn't require intense concentration or decoding. Over the last couple of years the Netflix series Love, has provided such a safe space. 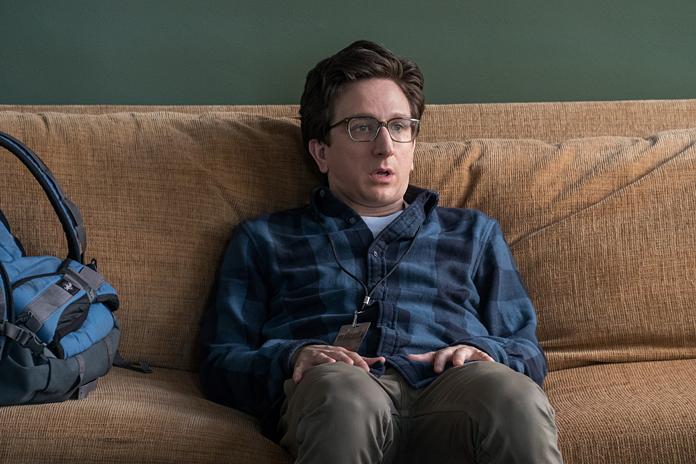 This is not to suggest vacancy in the romantic comedy created by Judd Apatow, Lesley Arfin, and Paul Rust, who also stars as the unlikely romantic lead, Gus opposite Gillian Jacobs as his loveable but complicated partner Mickey. Love deals with the thorny issues and confrontations of young modern relationships in contemporary Los Angeles that can make it uncomfortable but at the same time disarmingly relatable. For the third and final season, Gus and Mickey have entered into the serious and exclusive stage of their relationship, leaving behind the doubt that had spawned the volatility of their dynamic over the first two seasons, but not all of the dysfunction. The same band of misfits surround their lives at home and at work as they make a go at a mature coexistence while reconciling their individual pasts, about which as we learn, neither is entirely transparent. This show has always succeeded in its exploration of awkwardness with forgiveness. Interpersonal exchanges play with the feel of being extracted directly from the average person's life and no character is meant to be that sharp or winning. Latent desperation looms behind earnest camaraderie and funny moments pivot on a dime into tense personal jousting, where underlying worry is aired like laundry. This can be a fine line to walk, however, and the show stumbles into travesty a little too far at times, making you squirm with associations in your own personal history. The character of Randy (Mike Mitchell) who plays the oblivious boyfriend of Mickey's roommate Bertie (Claudia O'Doherty) is a maddeningly frustrating example. Anyone who has ever lived with roommates—so basically everyone—can place someone like him at some point in their past, or present if you have such misfortune. He doesn't understand just how cloying and annoying he is and no one really has the courage to tell him. Another example comes in an episode where we are introduced to Gus' former fianceé played by Vanessa Bayer, at the wedding of their mutual college friend. Her role is pretty tough to stomach after a while, as her desperation over being single and lonely becomes overbearing and humorless. The tension usually breaks however, as it will in Apatow stories with funny lines like one from Randy as he stands under an AC unit at a party they crash and quips "It feels like a snowman is sitting on my face"